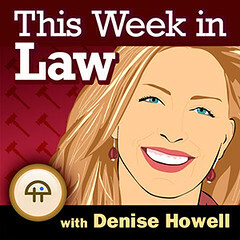 Tomorrow will be a fun first for this WEEK in LAW: we'll be live on TWiT.tv starting at 3:30 p.m. Pacific. You can watch at live.twit.tv, or on Stickam or UStream. Chat with us real-time at irc.twit.tv or on FriendFeed (the Stickam and UStream channels have their own chat as well, but I won't be monitoring those while we're on.) Guests are Ray Beckerman, Eric Goldman, Colette Vogele, and Evan Brown, and Leo's joining us too (yay!). Discussion notes are being aggregated here (tag something for:thisweekinlaw in del.icio.us or @dhowell me on Twitter to suggest more).